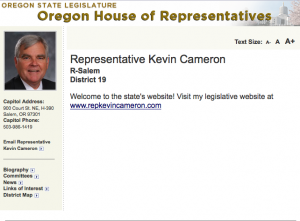 Representative Kevin Cameron is an active state legislator who works hard to serve and be apart of his East Salem district. Cameron regularly held events and send out direct mail to communicate with his constituents on important issues. While Cameron’s offline efforts were in full swing, his online platforms needed work. His official state website looked the same as it did three years ago, his e-newsletter list only contained 500 emails and he had yet to participate in social media. In order to maximize his exposure and reach more of his constituents, Cameron knew he needed to embrace new technology and make social media a focal point of his communication strategies. Optimize constituent contact and district outreach through a modern website, integrated e-newsletter, creation of social media platforms, and email database enhancement. Integrating new platforms and tools into a coordinated strategy while growing Cameron’s email list and social networking communities. 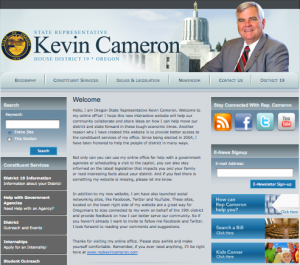 Cameron was attempting to be the first Oregon state legislator to have a privately designed website and fully integrated e-communication system. This new approach had never been tried or tested before. Common Ground created an interactive website that was fully integrated with the e-newsletter, social media channels and telephone town systems. His site contained all the latest features, including online videos, e-surveys, constituent contact forms and social networking share capabilities. To increase Cameron’s email database and social networking sites, his district voter file was cross-matched for email addresses. Subsequently, his emails were cross-matched for corresponding social networking profiles, which were appended to his new email database. Cameron utilized his cross matched social networking profiles to quickly add hundreds of new Facebook fans and Twitter followers. After state tax increases passed, Cameron proactively engaged his constituents concerns through a telephone town hall. Cameron used his new system to advertise the event and sign up interested participants to be called. He reached more of his constituents in one night than all of his other traditional town halls combined.